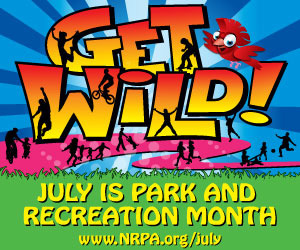 EDITOR’S NOTE: This is the fourth in a series we’re posting throughout July in observance of Parks & Recreation Month. Parks and Recreation has become such a consistent influence on our lives that we sometimes overlook the important health, environmental, psychological and economic contributions it makes to our communities. Since people tend to exercise more when they have access to adequate facilities and programs, Parks and Recreation encourages healthy lifestyles. Frequent exercise helps people live longer and stay engaged, and with our aging population, it’s crucial to help our citizens stay physically and mentally active. Parks, open spaces and trails play key roles in preserving the things that are meaningful to all of us, such as maintaining water and air quality, reducing congestion and protecting wildlife. Parks and Recreation professionals strive to be good stewards of our environment. Parks and Recreation helps communities develop their identities through well-maintained facilities that are key elements in safe, family-friendly communities. Involvement in Parks & Recreation programs can help reduce loneliness, curb antisocial behavior, lessen emotional detachment and even lead to lower crime rates. Homeowners and realtors say neighborhood parks enhance property values, and economic development folks tell us that parks help attract and retain businesses. A strong parks presence also results in a more productive workforce. According to research, about 80 percent of Americans use local Parks and Recreation facilities each year, and 70 percent have a facility within walking distance of their home. College Station has 52 public parks covering more than 1,400 acres, with many providing tennis and basketball courts, swimming pools, hiking trails, dog parks and more than 60 miles of bike trails. We also offer adult recreational sports leagues in softball, basketball, volleyball and kickball, along with a competition-quality skate park. To discover more about what the College Station Parks and Recreation Department has to offer, go to cstx.gov/parks. So what are you waiting for? Go out and enjoy a park near you! This entry was posted on July 23, 2012 by City of College Station. It was filed under Parks and Recreation, Public Communications and was tagged with Parks & Recreation Month, Parks and Recreation.